My family loves the Big Game, my young kids particularly get into the party atmosphere. They are the loudest cheerleaders during the halftime show, biggest fans of the buffet table, and yes they kind of like the football too. With excited hungry kids, messes are bound to happen. It’s hard not to follow them around with a napkin and hand wipes but all this cleaning up means I don’t get to enjoy the party. This year I am letting go and focusing on the fun because I have a secret weapon in the laundry room, Persil® ProClean® laundry detergent, a powerful stain fighting formula for a premium clean. 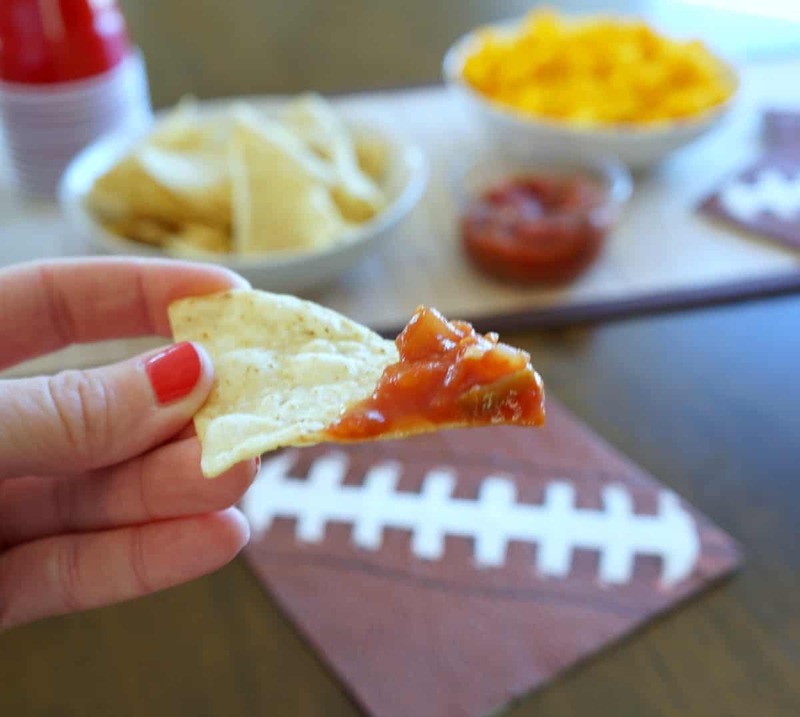 Our Big Game parties are typically just our family, sometimes Grandparents and a few friends stop by. We enjoy savory snacks, fruity drinks and do a lot of celebrating. My kids get to eat in front of the TV and more often than not their snacks end up on the floor. Spills happen to the best of us, but letting go just a bit is going to help me enjoy the party. 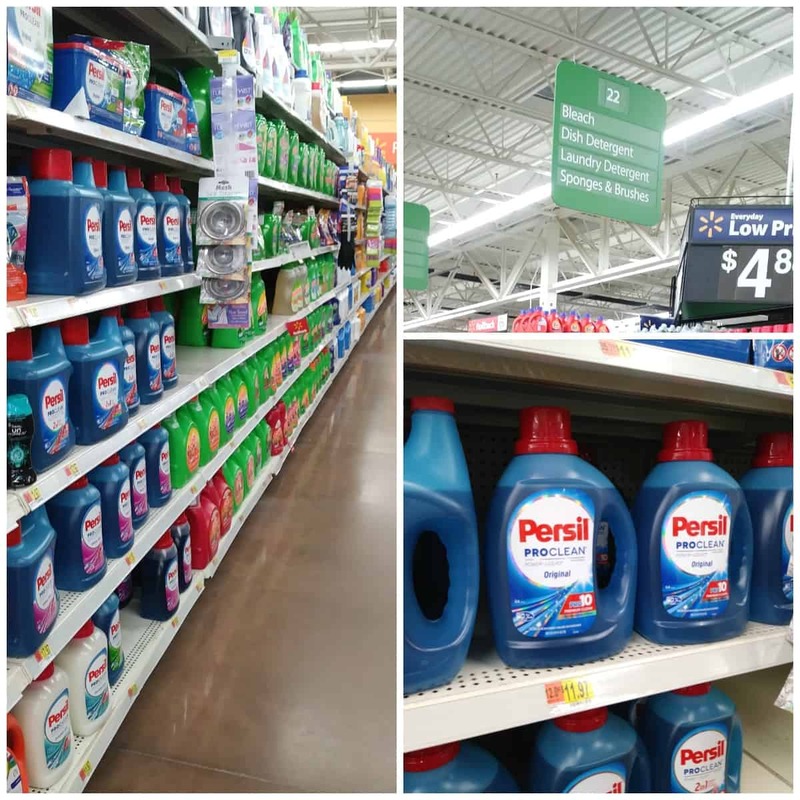 I recently discovered Persil® ProClean® Laundry Detergent at Walmart and have been impressed with its ability to help remove tough stains. Persil laundry detergent is a premium, powerful detergent. Formulated with special Pro10 Technology, it delivers 10 Dimensions of Clean to stand up to life’s messy moments. Knowing I can use this on all of our clothes after the party gives me peace of mind knowing that a little spill won’t ruin a shirt or the celebration. 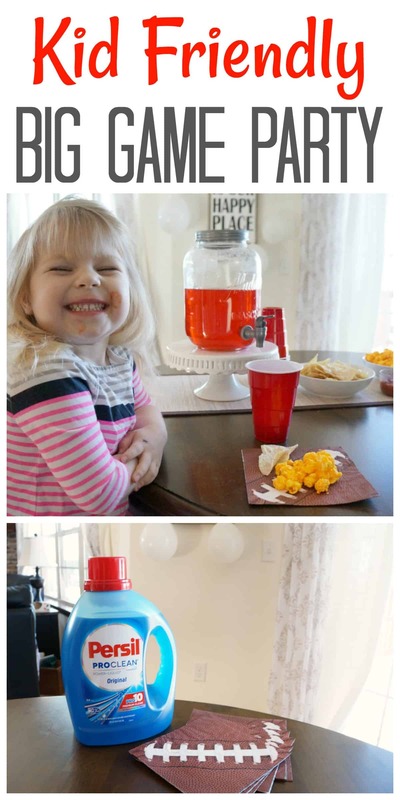 Set a separate buffet table for kids. Keep it within their reach and fill it with snacks they can grab and take with them. Keep the warm and heavy foods up higher at an adult buffet for safety. 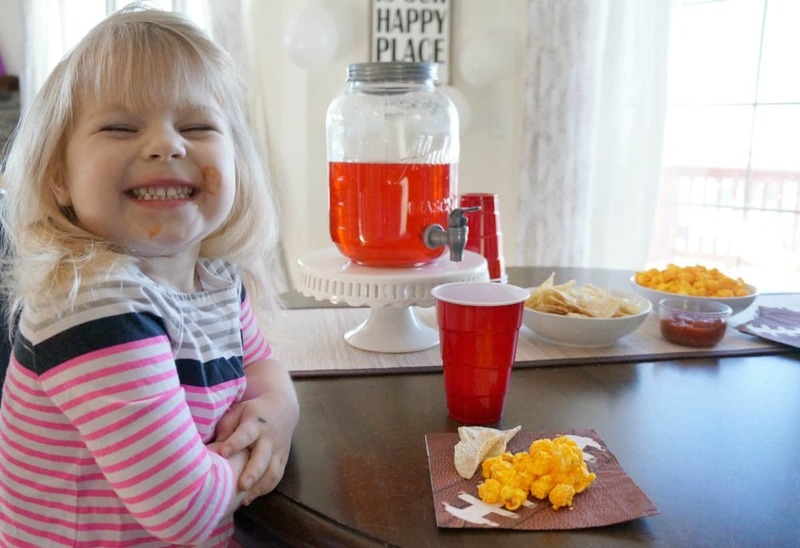 Serve mild snacks that aren’t too hot or spicy for kids. I gravitate toward popcorn with candy and dried fruit to mix in, chips of all kinds, bite size sandwiches and little cookies. Kids can grab what they want and fill up a plate. 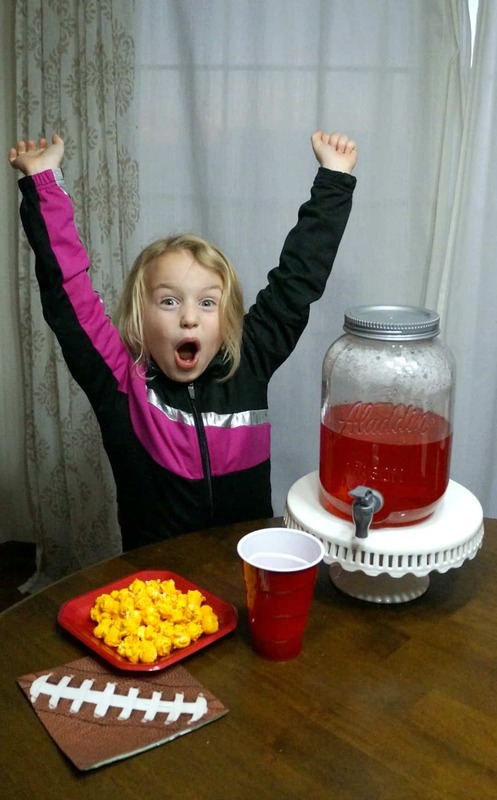 Make a fizzy punch using pre made fruit punch and a little white soda. It’s just fancy enough for a party but not too complicated. Serve it in a dispenser, like the one shown above, so kids can serve themselves, skip the bowl and ladle. Put up balloons and streamers to decorate for the Big Game. These simple and easy decorations double as balls and pom poms that kids can play with during the game. Bottom line, keep it simple and everyone will have a good time. Serve delicious food and try to overlook that inevitable mess, spills happen but you can always clean up after the party. Messes will happen, shirts will be stained, but after the game when everyone leaves I’ll do a load of laundry and pull out clean fresh clothes. I love the peace of mind I get from having Persil laundry detergent on hand. Before your Big Game party be sure to stock up on Persil laundry detergent at Walmart. Be sure to buy it early so you can use it on your regular laundry and see why Persil® Original Power-Liquid Pro10 was named “Best New Liquid Laundry Detergent” by Family Circle in 2017. I’d love to hear how you will be watching the Big Game this year. Be sure to grab Persil laundry detergent and everything else you need from Walmart for a fantastic get together.